Need to buy a pushchair or child car seat for your new baby? Our expert tips will help you choose wisely. October’s annual baby boom means there are plenty of parents-to-be just like you hitting the shops in preparation for their new arrivals right now. If you’re one of them, you might be daunted at the prospect of braving the baby stores – especially if it’s your first child. While there’s a lot that can be chucked into a shopping basket in a rush, or ordered online for next day delivery, two of the most important purchases on the list require a bit of forward planning: your pushchair and your child car seat. Which pushchair is best for you? You’ll need a pushchair with a newborn friendly seat –– which not all pushchairs come with, even if they say they do. Or a carrycot. You’ll also need to decide whether you want a travel system (wheels you can attach your car seat onto to make it easier to get your baby from buggy to car) or a more basic buggy for making it easier to nip around town. Use our pushchair chooser tool for a breakdown of the pros and cons of the different pushchair types. Which baby car seat is best for you? Car seat choices can be even more confusing than pushchairs but your very first car seat is the most important one you’ll ever buy. Take a look at our guide to choosing a child car seat to find out whether you need to get a Group 0+, iSize or multigroup seat for your new baby. Which? car seat reviews are unique. Unlike other reviews sites, we base our ratings on actual crash test data, so our reviews highlight any weaknesses a baby car seat may have, before you buy it. Visit our child car seat reviews to compare results. Once you know what type of pushchair or child car seat you’re looking for, you can narrow your search down and start to think about things like budget and extra features. The big baby purchases can be really expensive, so think about how much you’re realistically willing to pay and sort through our pushchair reviews by price. Do you really need a big name brand packed with extra features you might not use, or is there a value for money hidden gem awaiting you? Our pushchair Best Buys reveal all. You can spend more than £1,000 for a pushchair but we’ve got Best Buys for £200. This is a great way to bring costs down a bit and give you some extra budget to spend on a baby car seat offering the best protection. If you’re tempted by a second-hand pushchair, head to our second-hand pushchair reviews to see which ones are worth hunting for on eBay and which will just be a false economy. For car seats, we don’t recommend trying to cut costs or going second-hand. We don’t think it’s worth the risk. You cannot tell simply by looking at a car seat if it’s been in a crash, or if crash protection has been compromised, and it could let you down when you need it most. It’s rare that we find a really cheap car seat that offers adequate crash protection, so if there’s one thing you should budget to spend on it should be your baby car seat. We have Best Buy child car seats covering all budgets. You should also double check our list of car seat Don’t Buys. If you’ve got lots of steps to navigate or a very small car boot, a heavy, bulky travel system may not be the best choice. If you’ll be doing lots of walks around the park, good wheels and suspension are a must. Do you use public transport alot? Think about comfort factors, such as holding the handlebars for a long time, reaching for the brake pedal. And check out how easy your pushchair will be to fold quickly if you don’t have storage space to keep it unfolded at home. Also examine the size of the pushchair’s shopping basket. Parents tell us this is one of the most important factors when choosing a pushchair, so make sure yours has enough space for you and look out for any extra pockets for stashing your keys and phone. For a car seat, think about how it will fit in your car. A car seat base is usually a good option so you can install the base into your car permanently and just pop the seat on and off it. Check whether your car has Isofix connectors or if you’re going to need to install your seat using the car’s adult seatbelt. Also check there’s enough space in your back seat and for any passengers in the front. Getting a perfect fit is vital. We always recommend that you get a car seat expertly fitted into your car before you buy. 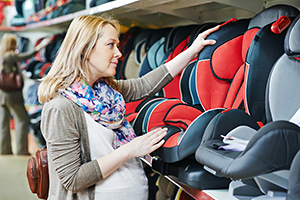 Find out who came out best when we investigated retailers fitting child car seats. Get prepared. It’s a good idea to have a list of options compiled before you enter a shop and get bombarded with choices. We’ve taken some of the work out of this for you – good places to get started are our top 10 best baby car seats and top 10 best travel systems. When we asked parents what they thought was important when buying a pushchair, most of them mentioned trying it out in the store before making the purchase. It’s the only way you’ll get a proper feel for how it handles, folds and stores. Get hands-on with your car seat before you need to use it. It’s a good idea to be shown how to master fitting it before you buy it. And once you have bought it, practise fitting it over and over again, so you’re fully prepared and ready to transport your baby home once he or she arrives. Need extra help? Watch our how to fit a child car seat video guides.